9 February, London – COTTON USA is pleased to announce its sponsorship of designer brand and shirt specialists Palmer//Harding at London Fashion Week next week. Chosen for a fifth time to receive COTTON USA’s highly coveted support, the designers will benefit from a programme that has helped a wide range of leading fashion designers, such as Faustine Steinmetz, to showcase their talent and bring their creations to life through the use of U.S. cotton. This A/W17 LFW season, Palmer//Harding has once again evolved their collection with the help of COTTON USA, and will be presenting their latest work at Mary Ward House, London, on Saturday 18th February 2017. This season will form the latest installment of the duo’s iconic modern designs, which will integrate innovative pattern cutting with expert draping techniques that have been hailed as ‘bridging the gap between wardrobe and statement pieces’. 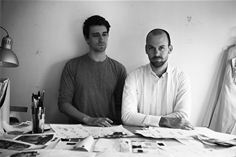 Palmer//Harding’s Levi Palmer and Matthew Harding met at Central Saint Martins in 2007 and launched the collaborative brand in 2012. Through their progressive designs and collections, comprised of shirts and shirt-dresses made from U.S. cotton, Palmer//Harding have innovated shirt design, and have often been cited as “the shirt boys” by the fashion industry, press and buyers. “More than ever, working with fabrics and fibres that are of the highest quality and responsibly produced and sourced is an essential part of the design process. Just like COTTON USA, Palmer//Harding are passionate about this process, carefully considering the source of their fabrics before bringing their designs to life. We’re delighted to be returning to London Fashion week with them for another season,” Thiers-Ratcliffe added. For more than a decade, COTTON USA’s London Fashion Week sponsorship programme has provided a valuable platform for designers to elevate their profile and expand their individual brands. Previous recipients of the sponsorship includes Richard Nicholl, Meadham Kirchhoff, PPQ, Preen and Louise Gray. Palmer//Harding will present their AW17 collection at Mary Ward House on Saturday, 18th February 2017, at 16:30pm.